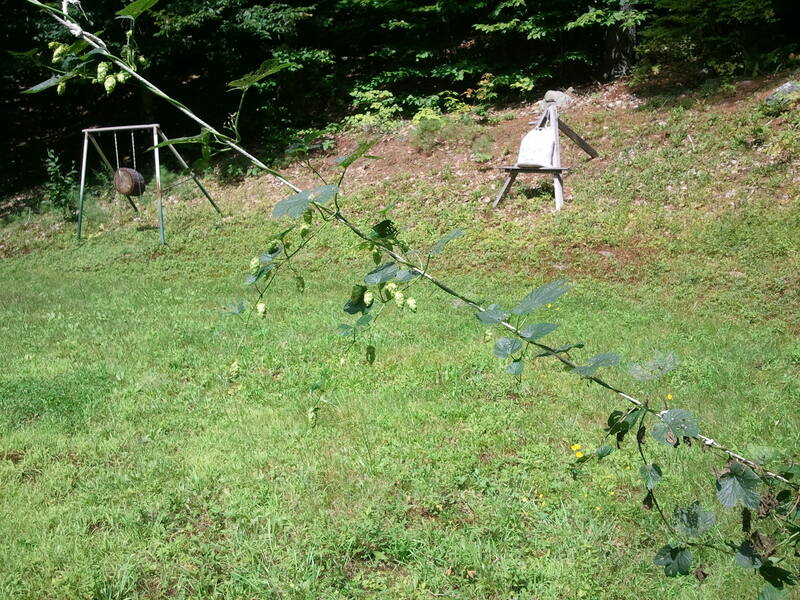 Tettnanger Hop experiment fails – Success! 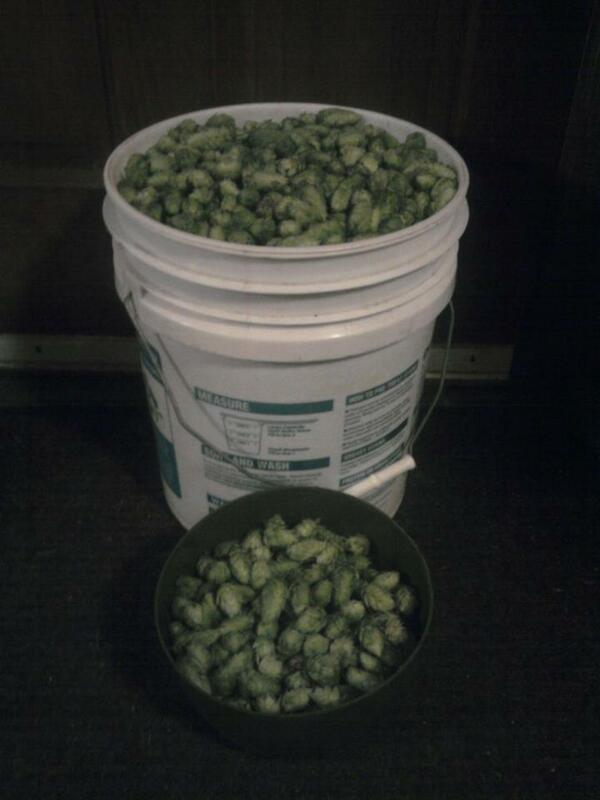 Earlier in July I posted about testing a new setup for the hops ( go here) . We have discovered that attempting to grow them sideways is a very labor intensive project which no sane brewer would truly have time for. Return of the Triffids. Upward was pretty fast, horizontal, not so much. Following the horizontal lines was a daily chore which required a lot of time. As you can see things started out well enough. 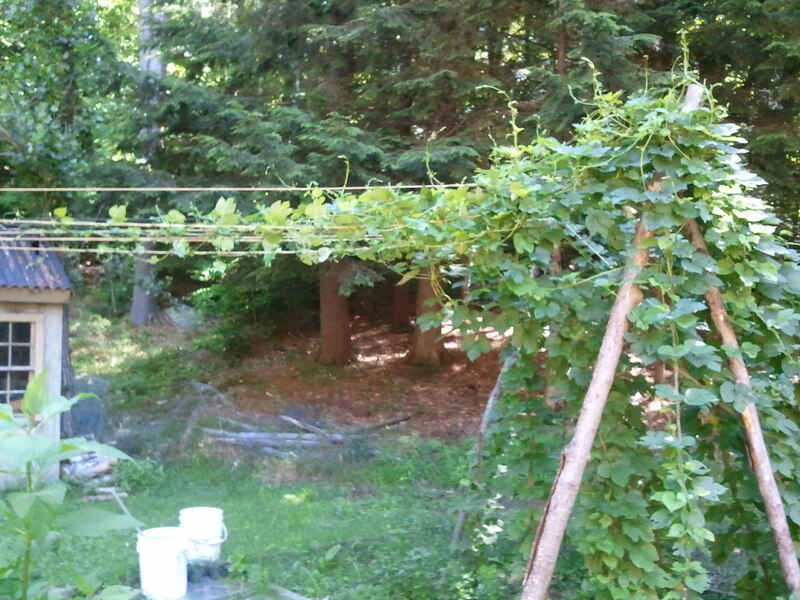 The hops grew up the sticks they were started on and then reached out and wrapped around the guide wires. This was followed by a lot of training the first couple weeks to keep them on the line. It seems they weren’t really inclined to follow the string once it went horizontal and I was out there several nights after work, attempting to keep them on the lines when they started moving out. My daily life schedule eventually took over and I decided to just let them go wherever they wanted after that. Needless to say they started weaving a carpet amongst themselves and I was left with a tangle. 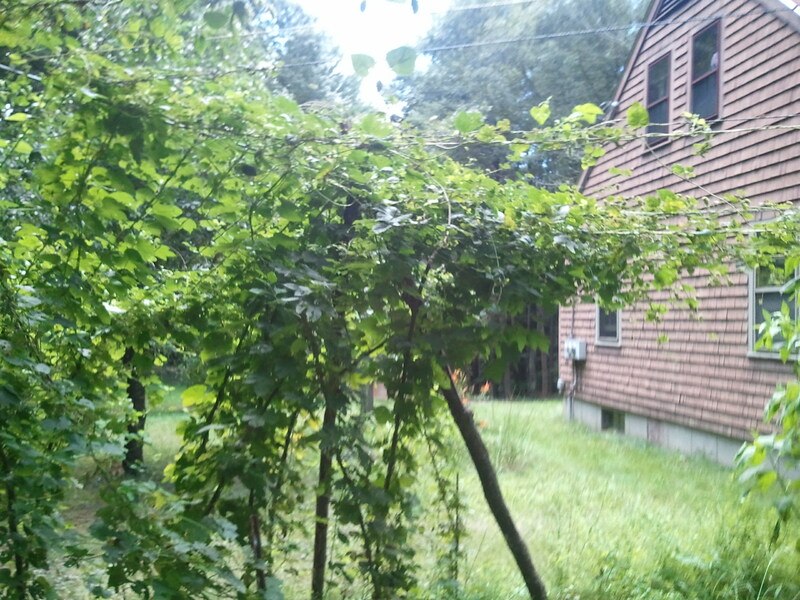 The hops started filling in but I noticed the vines on the backside of the overhang were not developing as fast because THEY WERE IN THE SHADE! This also had another unexpected effect: Bugs. Give them enough shade and the bugs had a comfy dark area where they could munch on the leaves and be protected from rain, direct sun, predator birds that might eat them, etc. We suffered greatly because of it. First, the leaves are incredibly dark due to the strain the plant had to endure just to keep absorbing enough nutrients to keep production up. Yes, the leaves will darken over the season but these are struggling. Looking at the leaves you also see the mold and the bug holes. 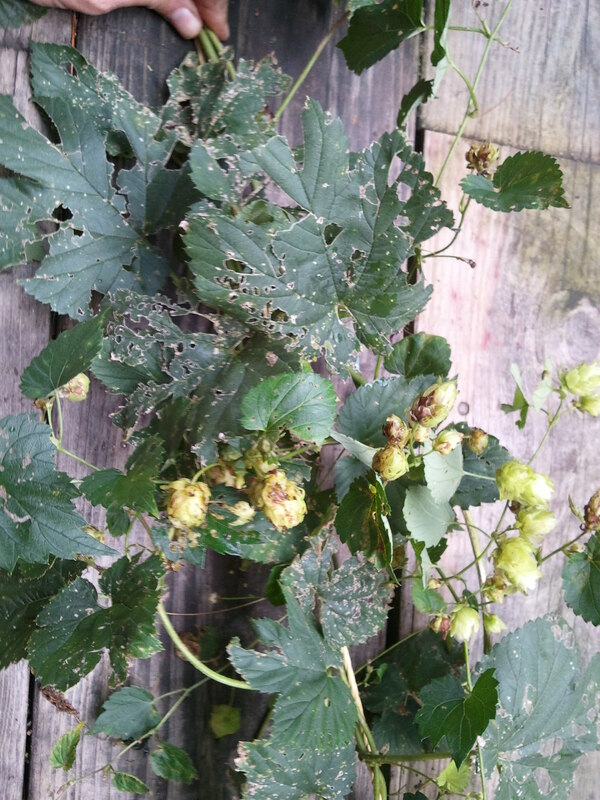 As a result, the hops on the plant are suffering being stunted. The brown is actually a completely unrelated problem. 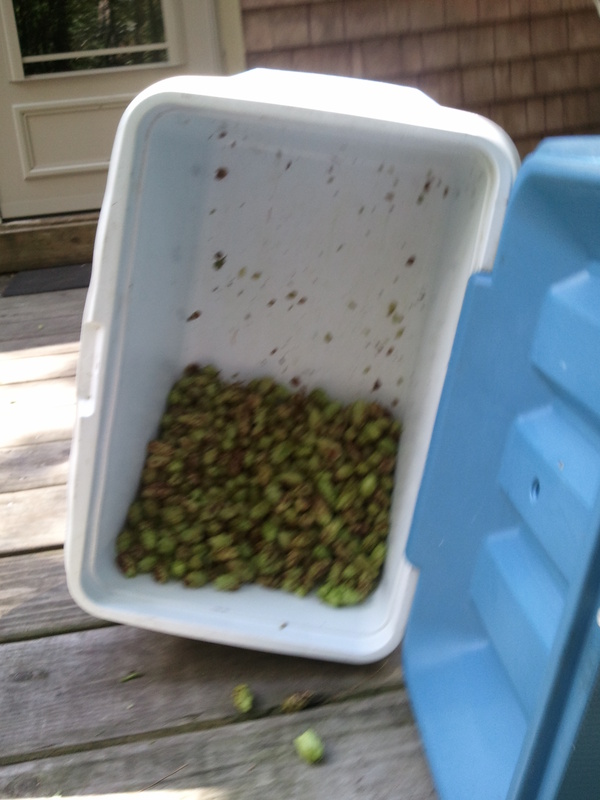 That was due to an intense rainstorm dumping tons of water on the plants the day before I picked them. 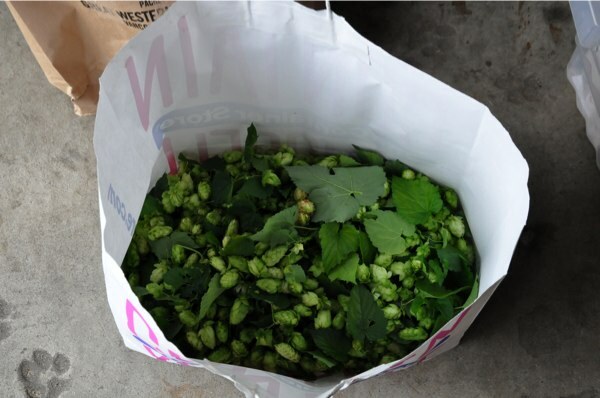 Most of the batch was soaked in this same manner and it turns the hops brown and in some cases rots them on the vine so they are completely unusable. In contrast we have a vine that I set up with a higher angle coming from the side. It actually took very little effort to get it started on the rope and it took off like a shot climbing on it’s own. Another nearby plant was put directly onto a pole and showed great growth all on it’s own. So as long as a 45 degree incline is instituted, the plant will naturally want to ascend. In the case of the pole where it’s straight up and down the plant flourished around it allowing equal coverage. 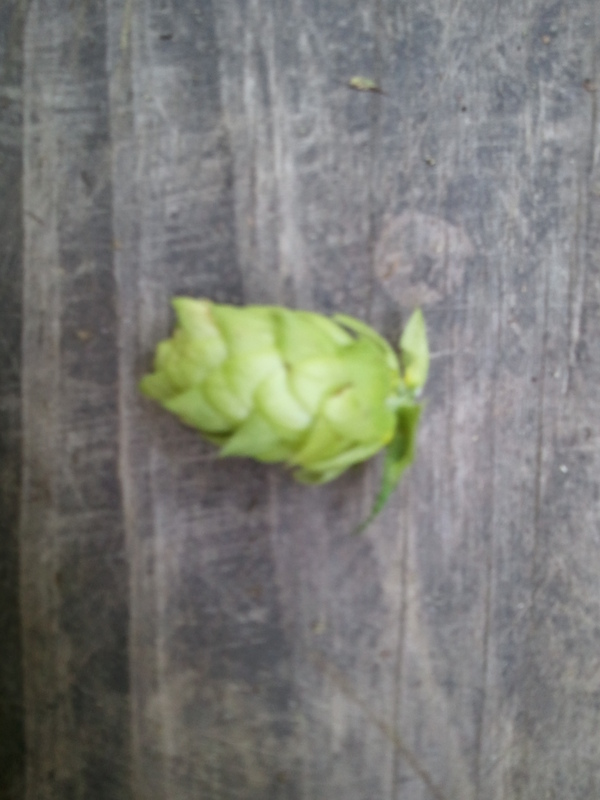 The hops on both of these plants were far thicker. most as a result of vertical height. The 2014 batch suffered the trellis falling and this year, due to an attempt to make life easier, the horizontal growth experiment showed that it was not preferable. I’m not using any pesticides or special farm equipment. The most high tech part of this whole process (and probably the most expensive part) is the nylon string I use to support the weight of the vines after we discovered that 8 lb twine doesn’t hold a vine 20 ft long up very well and if it rains, it’s about a useful as wet cardboard. 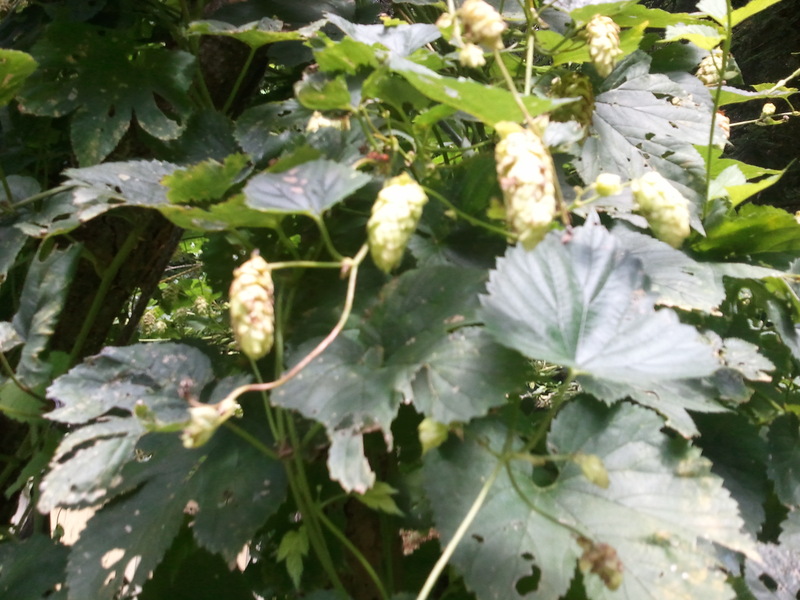 So although the crop was a failure this year, we learned a lot about growing hops. 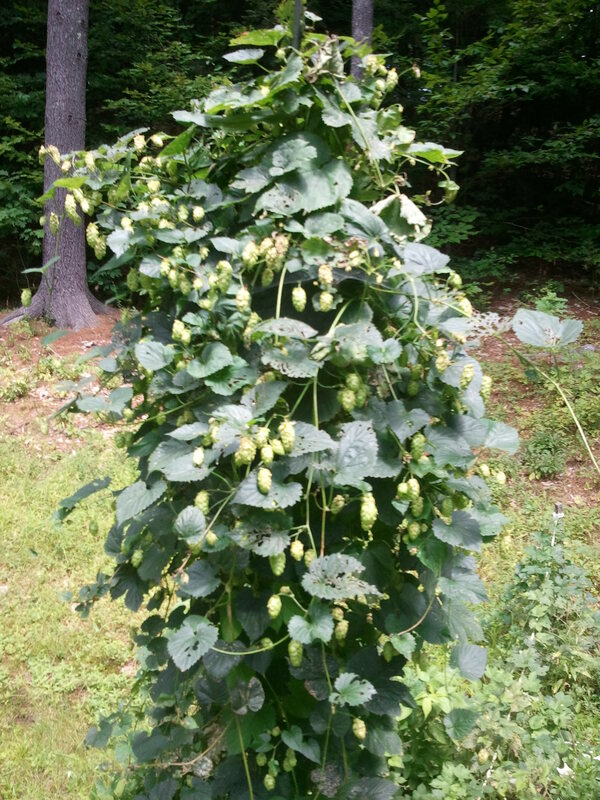 If found wild, they will scurry across the ground until the hops find something to help them climb up. Once they’ve got that height going, the sun and constant watering are all that are needed. The plant does the rest and you end up with a greater bounty.